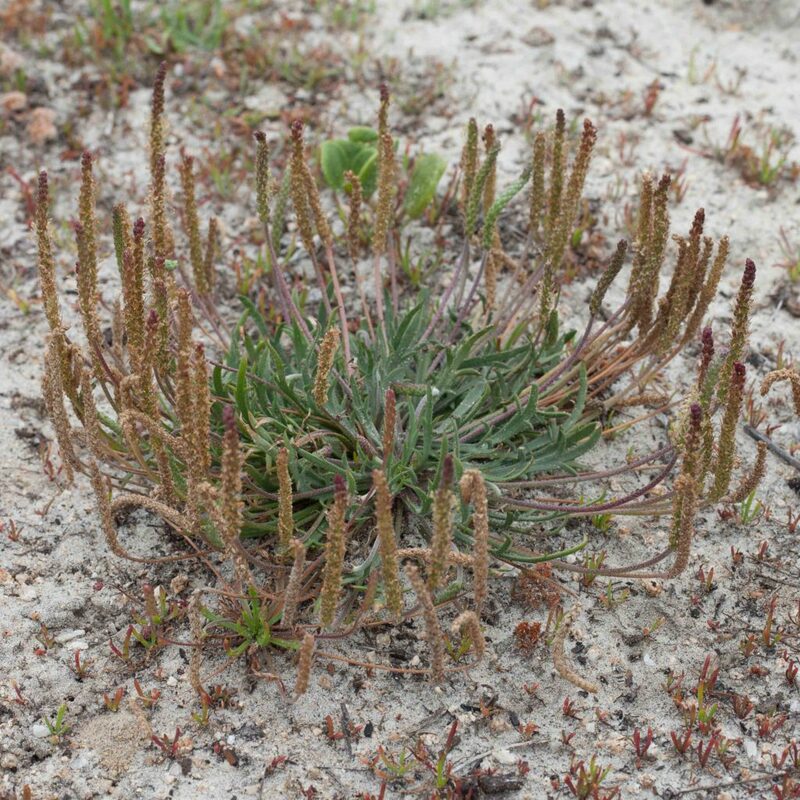 This has distinctive slender, pinnately-lobed, lanceolate leaves in a basal rosette. 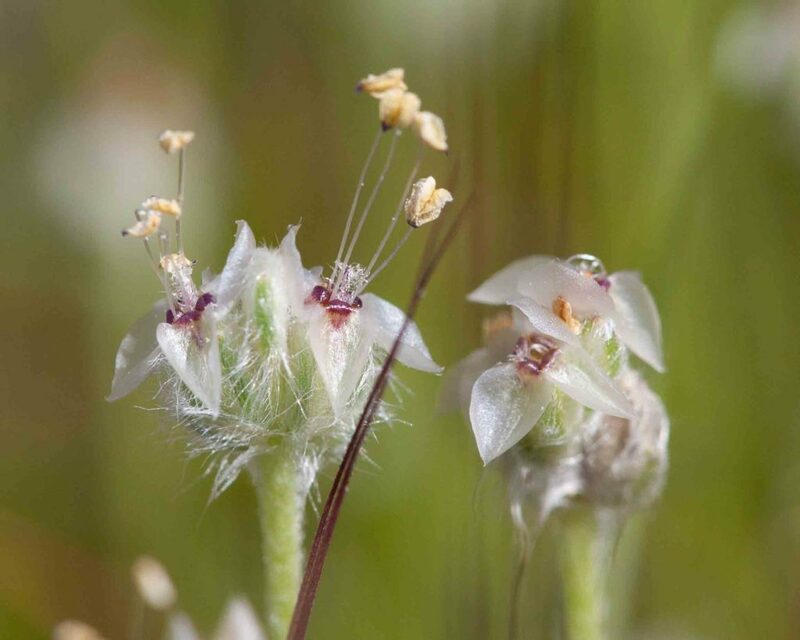 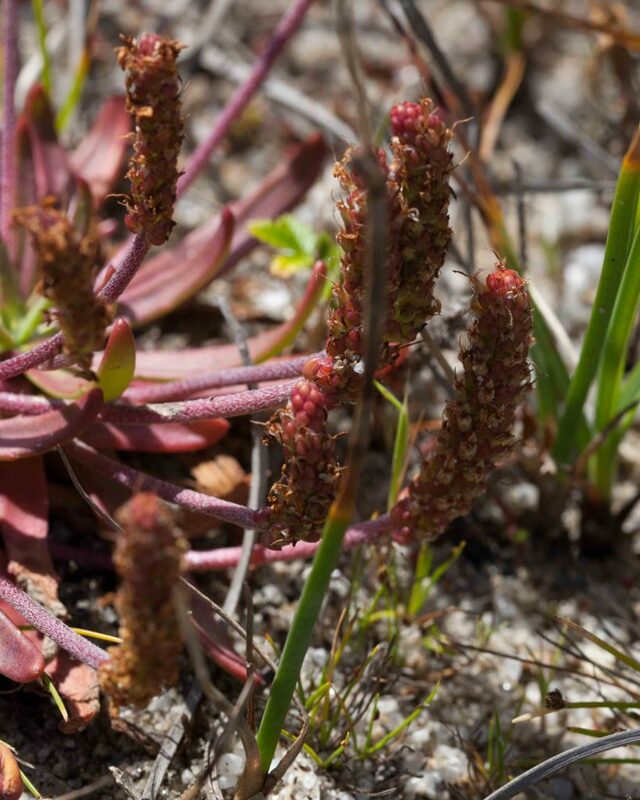 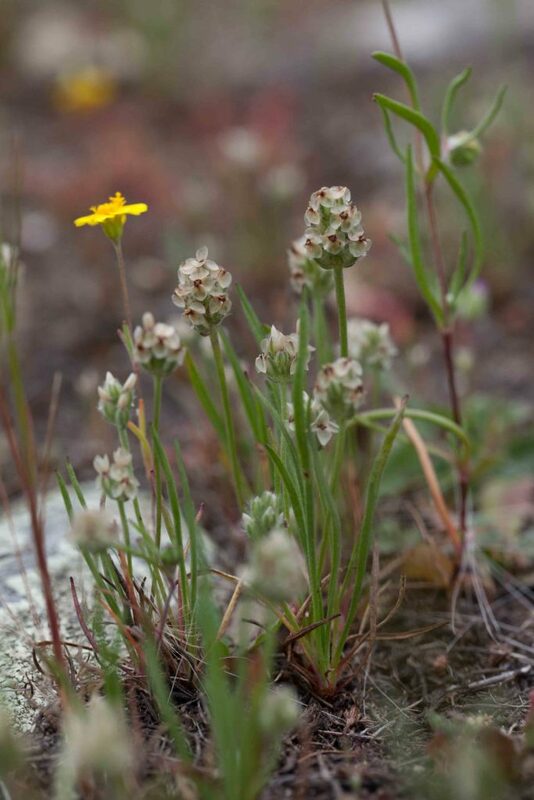 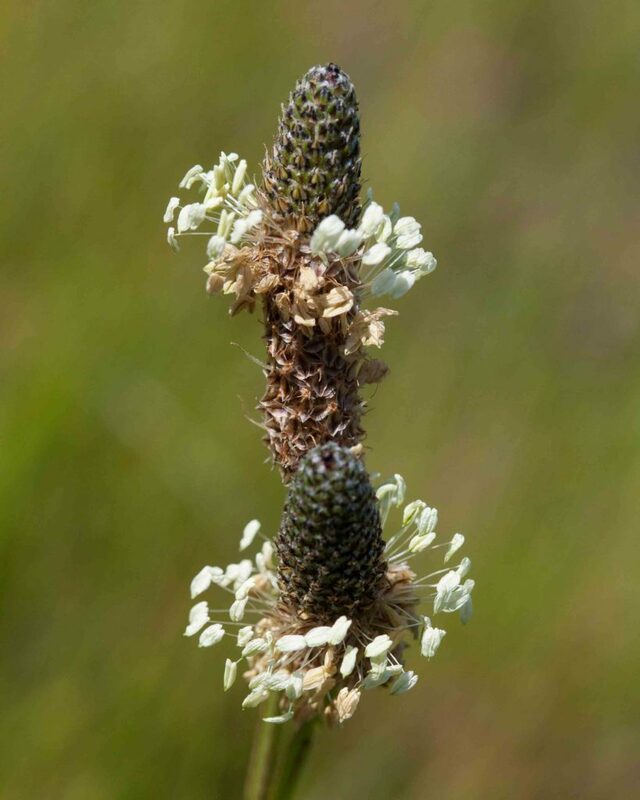 The flowers are spikes at the end if long curved peduncles forming a crown shape — hence the species’ scientific name. 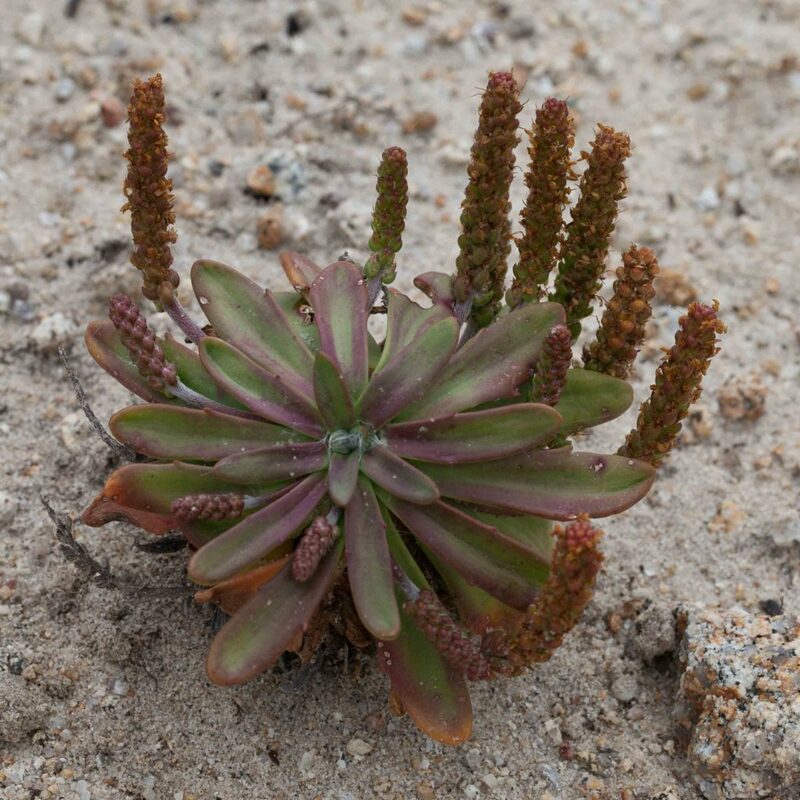 The flower spikes are nodding before the bloom matures. 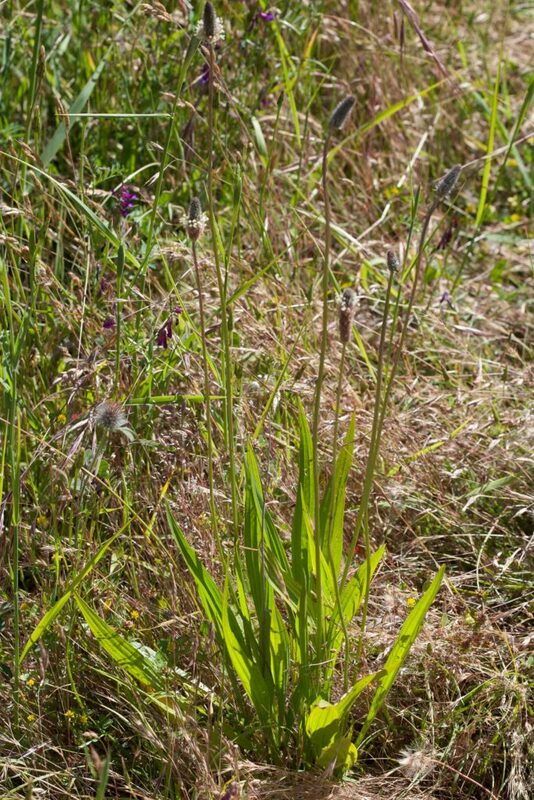 Very common and rather weedy. 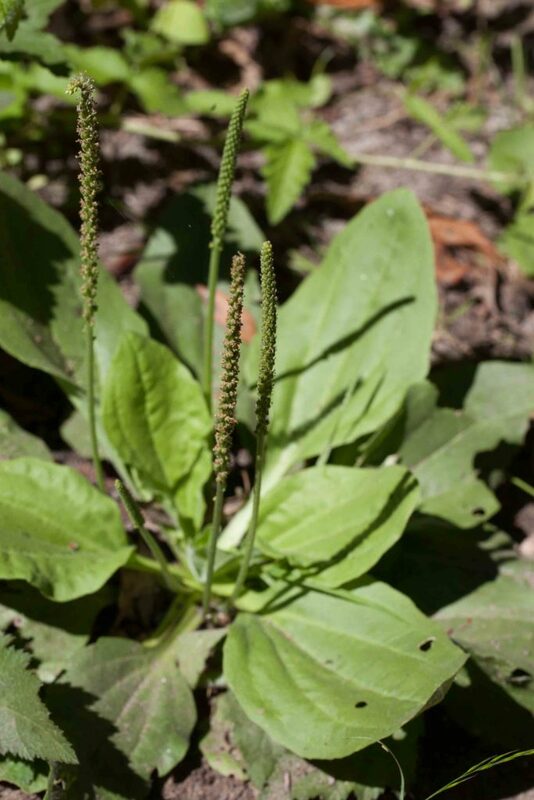 This is a small inconspicuous plantain with erect, narrow leaves and white flowers with 4 spreading petals, a deep red center, fine silky hairs and less obvious stamens and pistils. 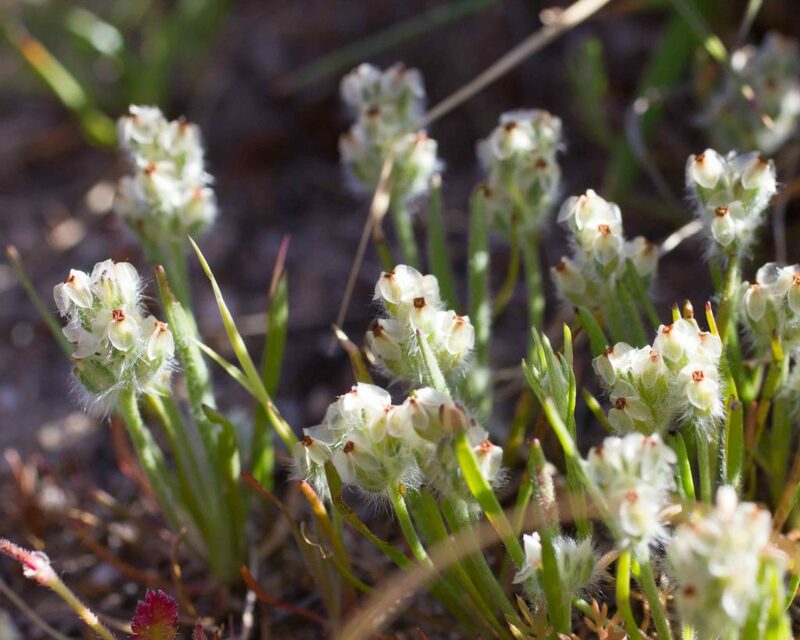 Although unimpressive to the naked eye, the tiny flowers are beautiful when viewed through a hand lens. 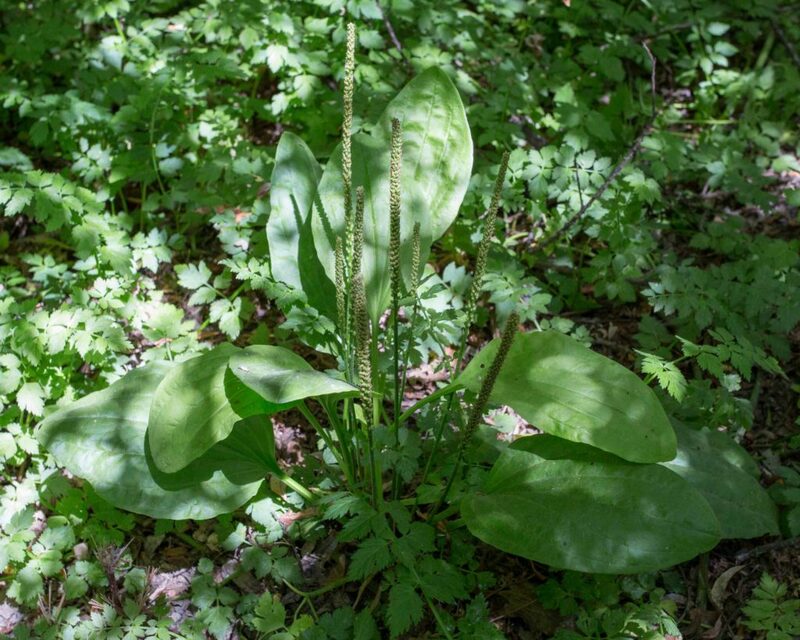 This is a common invasive species with distinctive erect to spreading, elliptic to lanceolate basal leaves. 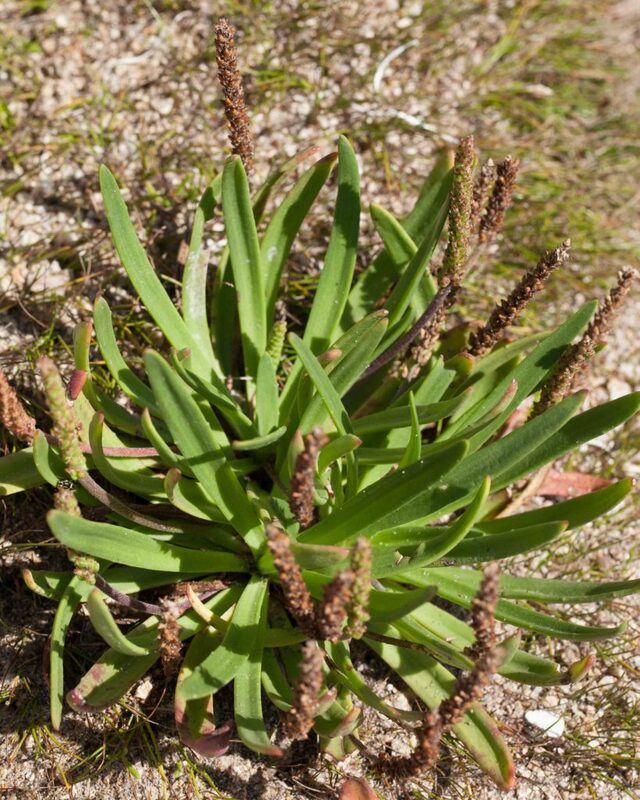 The inflorescence is a tight cone-shaped spike with flowers that mature from the bottom upwards, each with a pointed bract. 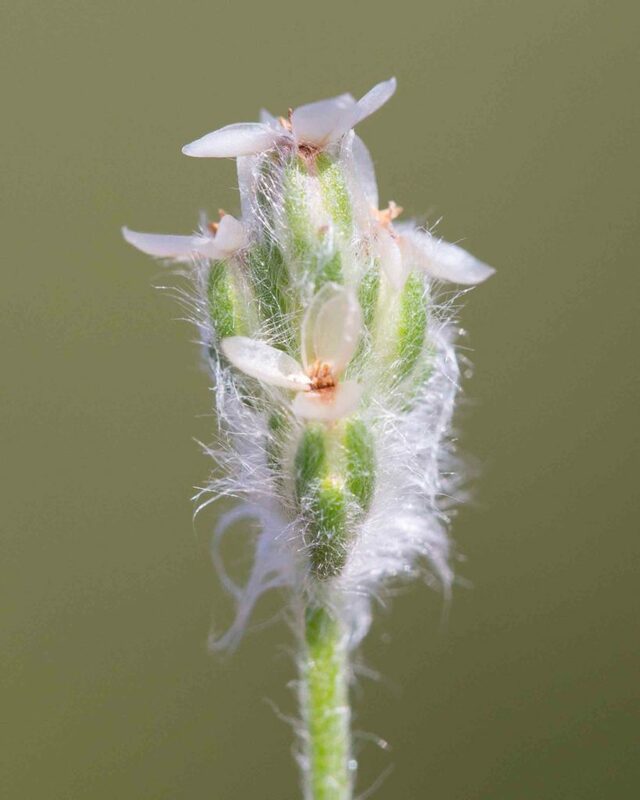 Most noticeable are the prominently exserted stamens with creamy-white anthers. 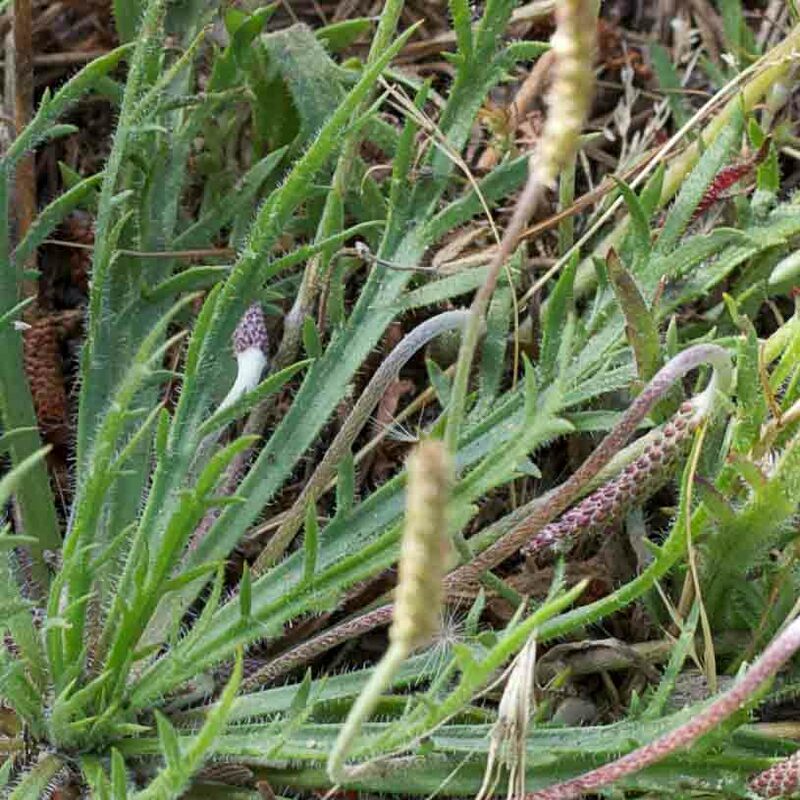 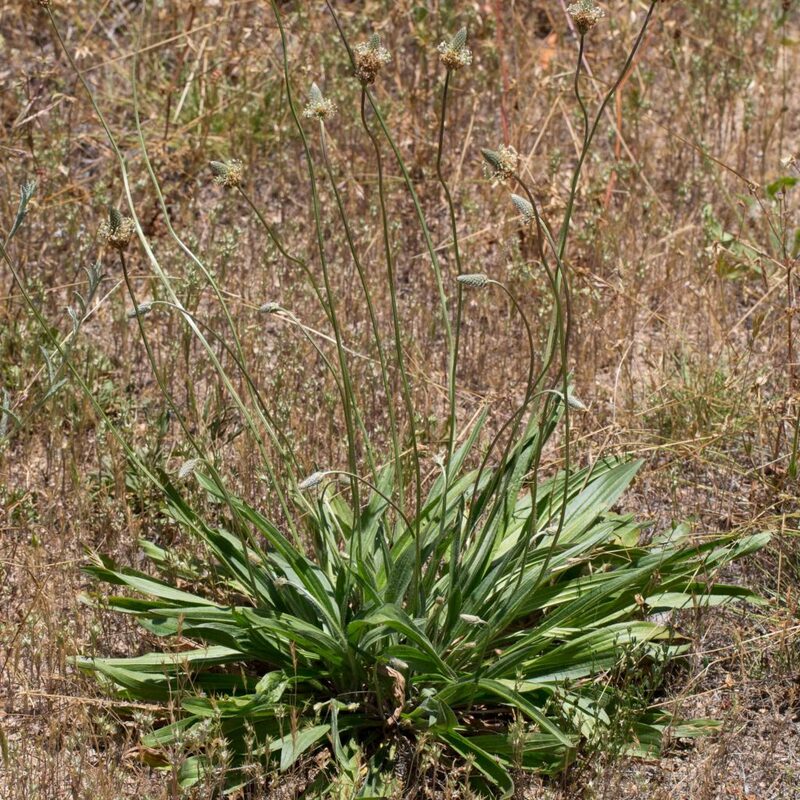 This is another common species, recognized by its broad, widely elliptical, more or less prostrate leaves which narrow abruptly to the petiole (unlike the leaves of the similar Mexican Plantain (Plantago subnuda) which narrow gradually towards the petiole). 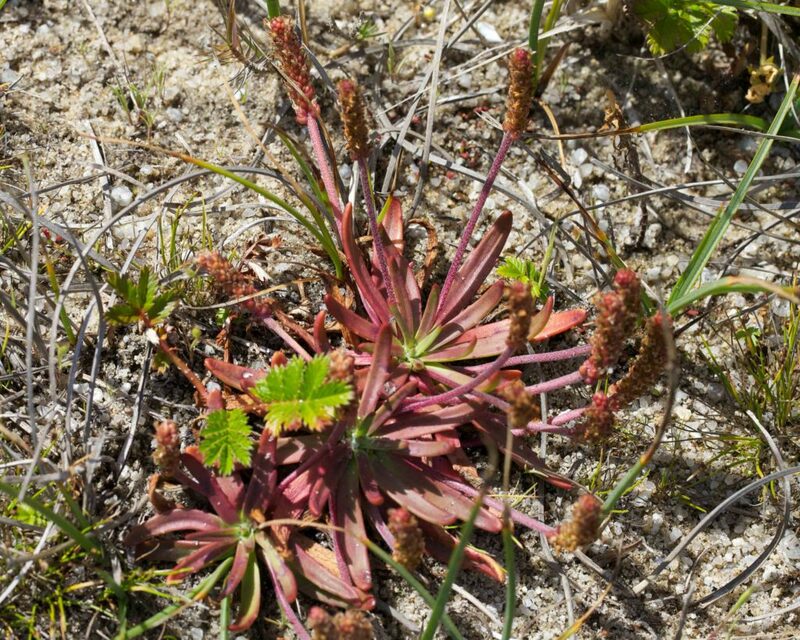 The flowers are in spikes that are less crowded towards the bottom. 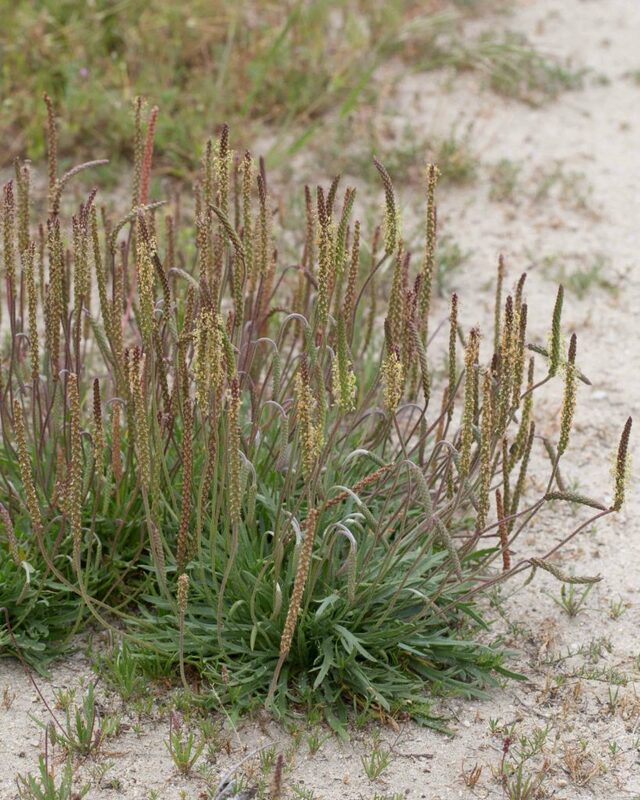 There are comparatively few flowering stems. 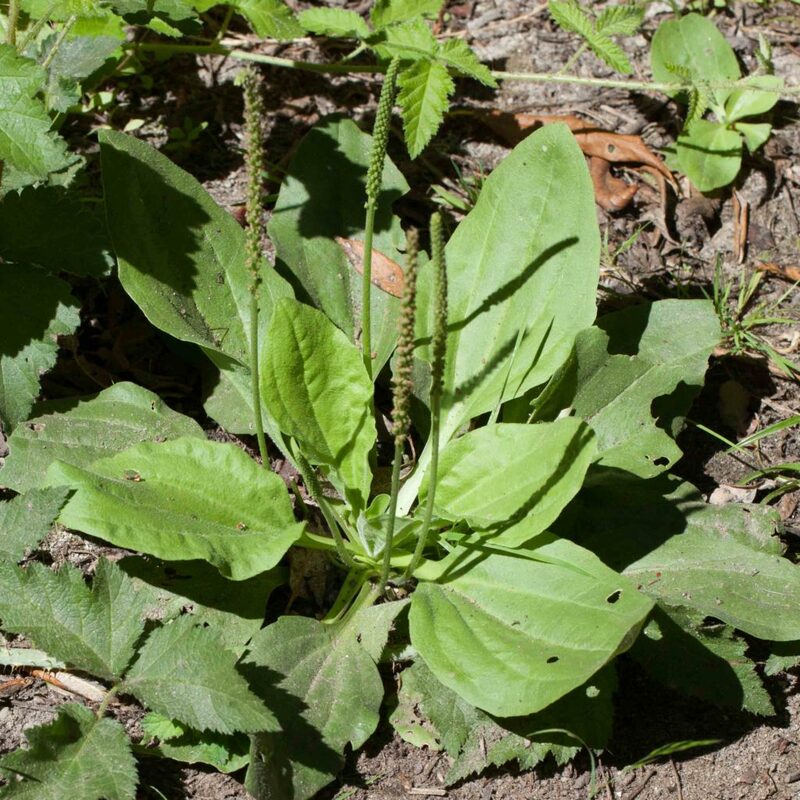 Another difference from Mexican Plantain is that the leaves are glabrous whereas those of Mexican Plantain can be sparsely hairy. 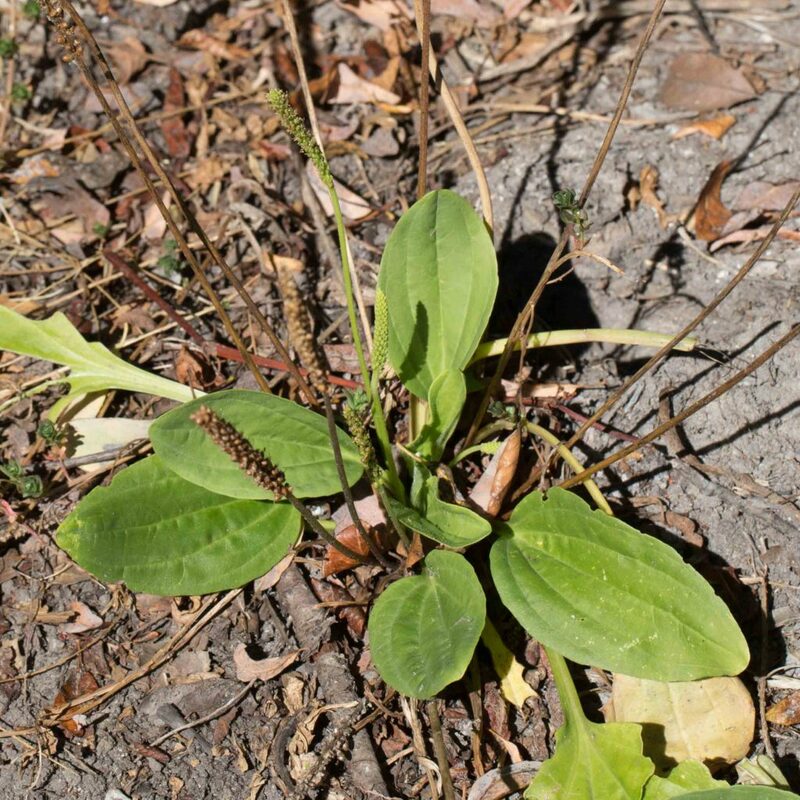 This Plantain has distinctive fleshy leaves, linear to narrowly oblanceolate and green to reddish in color. 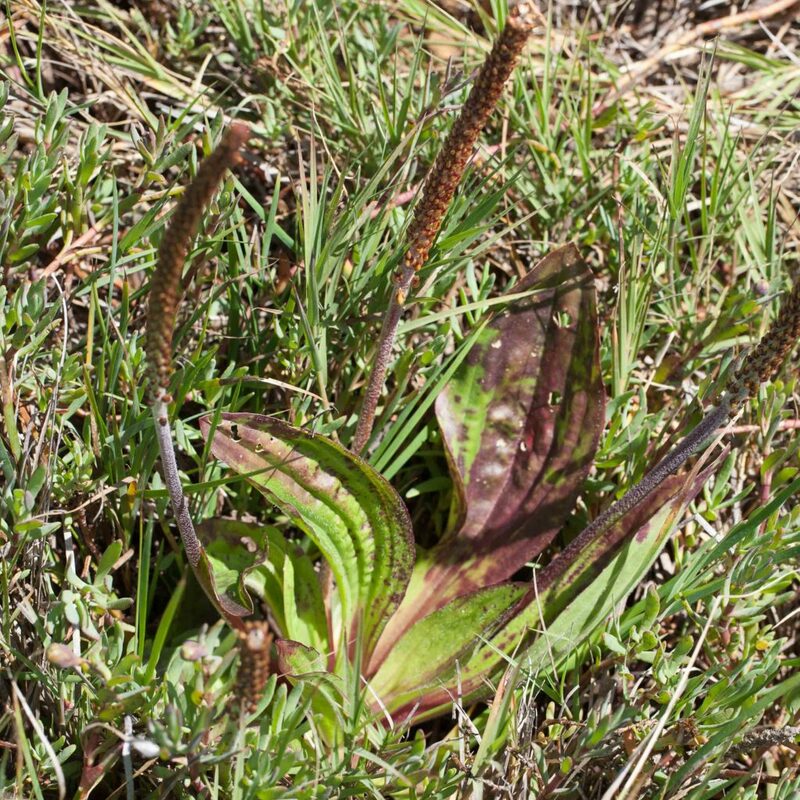 The flower spikes are short (less than 10 cm) and few in number. 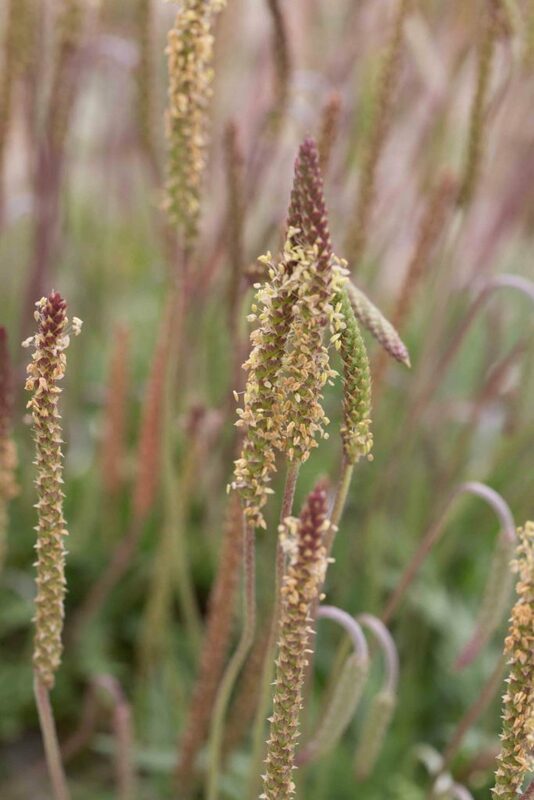 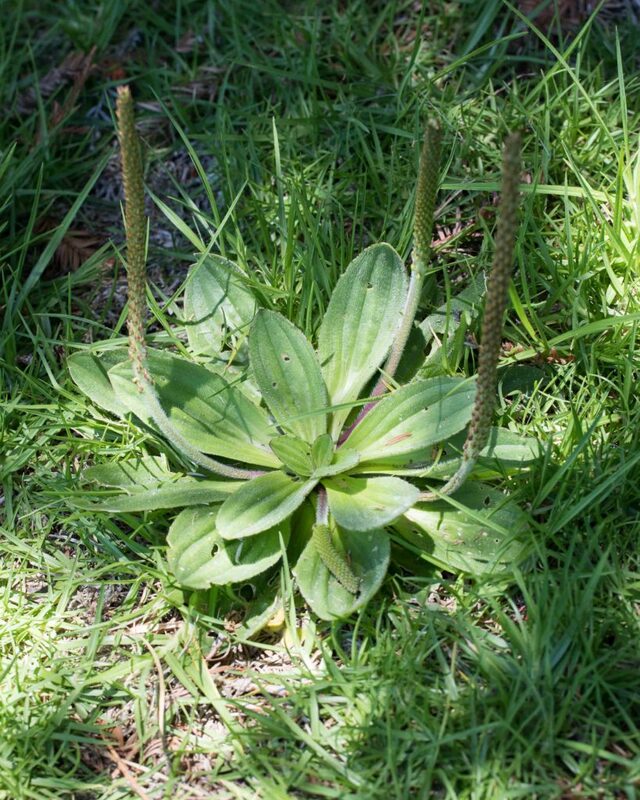 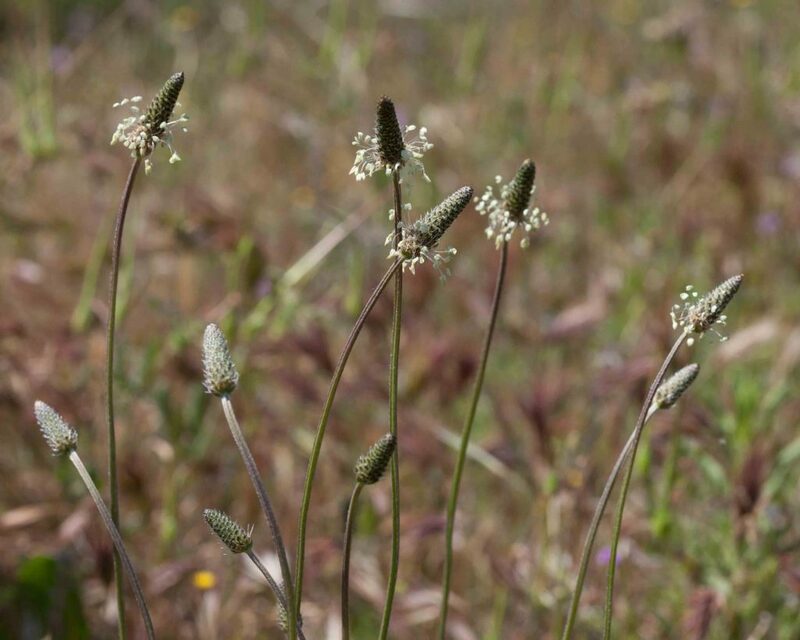 This is similar to Common Plantain (Plantago major) and has similar elliptic to oblanceolate leaves, sometimes much longer (up to 40 cm as against 18 cm long) and sometimes sparsely hairy and with a reddish tinge. 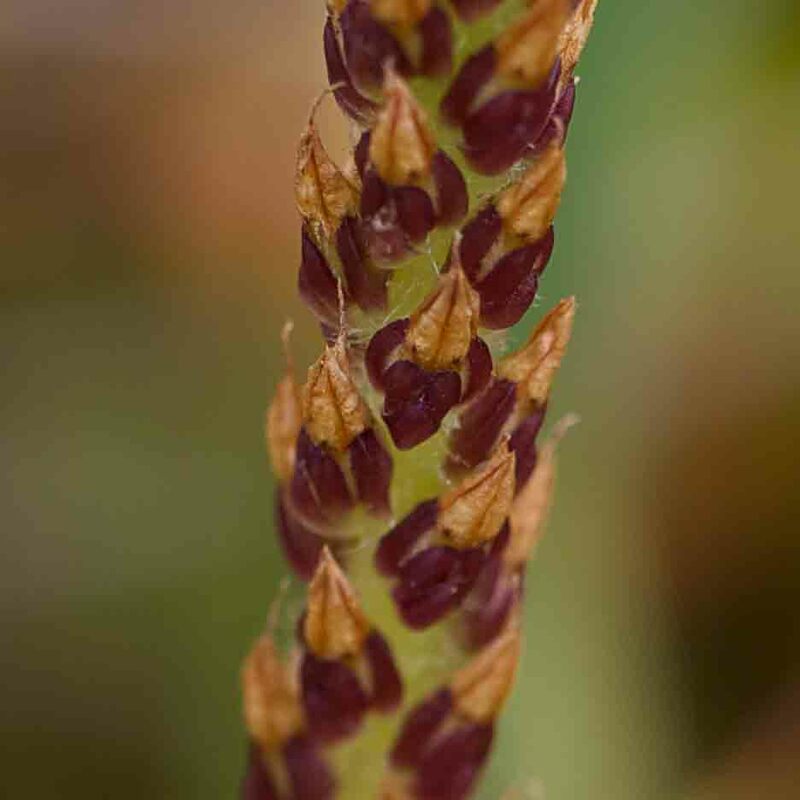 Most important, the leaves narrow gradually towards the broad petiole (unlike the leaves of Common Plantain which narrow abruptly to the petiole). 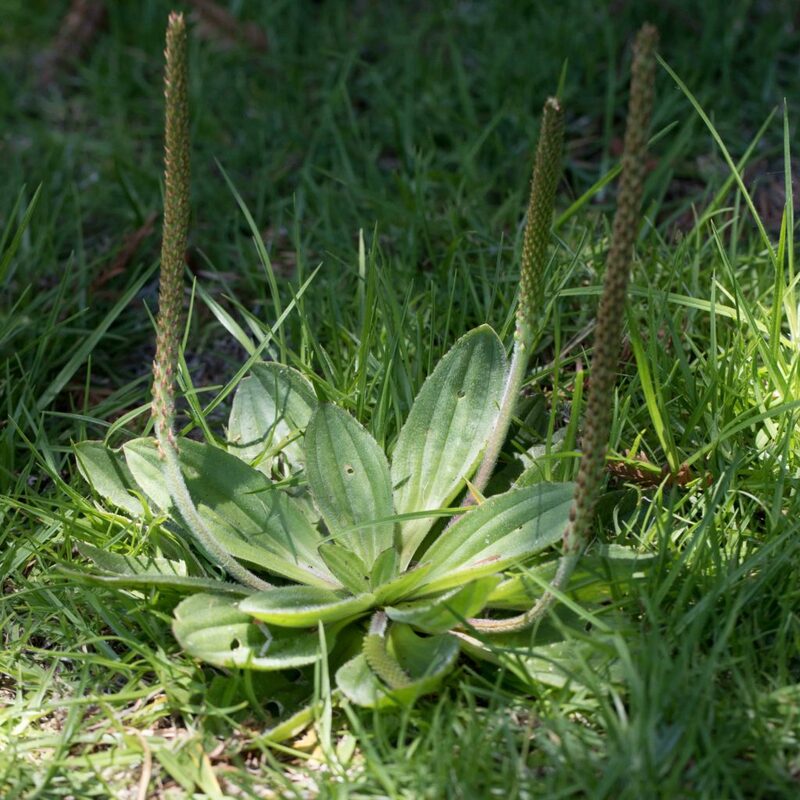 The unisexual flowers are in spikes that can be as tall as 50 cm when the peduncle is included.